I'm not crazy! Just don't try eggs... MREs are great otherwise! I get my pick in exchange for watering her grass she just reseeded, that's an immediate yes from me! First three I grabbed (as not all were available at once) are probably my top three choices. Once the cold months hit I'll throw the Chili and Stew in my car. In my few years of driving, I have yet to get stranded, but I've also driven in weather most people won't (one of the reasons I've taken a liking to SUVs over anything else) and some I probably shouldn't. But if I were to get stranded in the snow I wouldn't mind have a nice hot packed of DOD chili or stew to hold me over. It's definitely not top of the line food, but in my mind, these aren't terrible. I'm also not the most creative cook so they can bring some flavor to some meals XD And the little Tabasco sauce bottles are a bit of a collectible to me. I used to carry one on me at all times during high school. Other than that keeping a few stashed away at home is something I try and do, and with the Air Force Auxillary they are always good to have if you have to go out for a search and rescue mission, we have some very secluded areas compared to some of the "nearby" population centers. 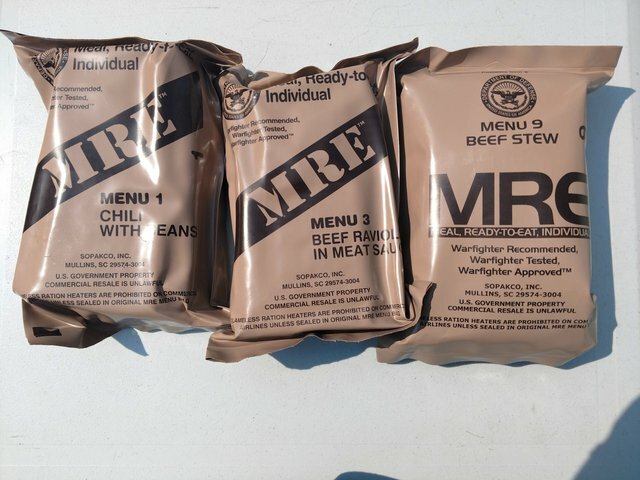 Hope yall got a kick, and if any of you have had an MRE I'd love to hear your stories!